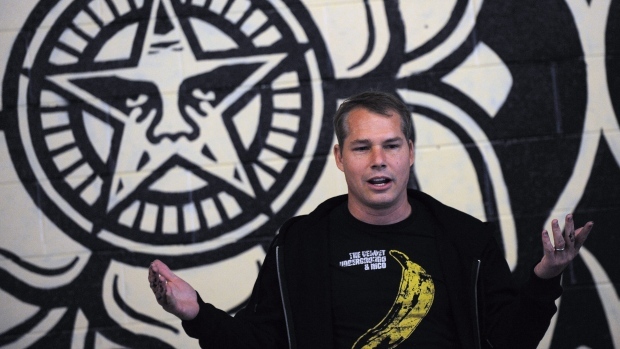 DETROIT -- Graffiti artist Shepard Fairey pleaded not guilty Tuesday to charges that he illegally tagged buildings in Detroit. Fairey was charged in a warrant last month with malicious destruction of property. Police say he caused about $9,000 in damage to some buildings while completing commissioned works -- including a large mural -- on other structures in the city. Fairey was arrested Tuesday and later appeared in court via video from a police lockup. He was expected to be released Tuesday after posting bond, according to the Detroit Free Press. His lawyer declined to comment. The newspaper reported that Doug Baker, an attorney for the city, said Detroit is enforcing laws against graffiti.
" ... We get people coming into the city that view it as a free-fire zone, that view it as a place where no one cares," Baker said. "We're changing that culture of belief." Fairey completed a roughly 185-foot by 60-foot mural in May on One Campus Martius in downtown Detroit. The work was financed by businessman Dan Gilbert's Bedrock Real Estate Services, which owns the building. The artist also visited with Detroit high school students and showed them examples of his work. But graffiti similar to Fairey's style also was found on other structures, including a water tower, buildings and freeway underpasses. Fairey was arrested last week at Los Angeles International Airport and later released. He returned to Detroit on Monday to face the charges. A July 21 conference hearing has been scheduled, followed by a July 28 preliminary examination. Fairey got in a legal dispute with The Associated Press after using an AP photo in his famous Barack Obama "HOPE" poster. He agreed in 2011 to pay the AP $1.6 million.